A slightly different post after a bit of a sabbatical whilst I prepared for and successfully took a technical IT exam, hence the lack of postings recently. I wanted to post something to acknowledge what is effectively a 30-year anniversary since I really got into the RPG scene. July-August 1983 I’d just finished third-year at secondary school for the summer holidays and a cousin of mine happened to mention he was into RPG’s and miniatures. So began our many trips to my local Games Workshop store in Birmingham spending pocket money on Tunnels and Trolls, Citadel and Traveller 15mm miniatures. I’ve still got pretty much everything I bought (mainly stored in the garage) but I still treasure my T&T books pictured below and my Traveller mini’s. 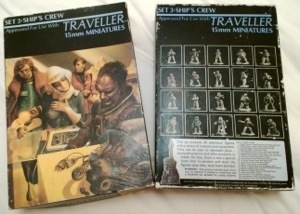 The Citadel Traveller boxed sets were my first Traveller purchases; I think it was a mixture of the monochrome images of the figures on the back of the box contrasted with the fantastic Jim Burns artwork that has been my most enduring memory about the sets. I purchased Set 3: Ships Crew and Set 5: Aliens first and eventually ended up with most of the figures from the other sets, by buying blister packs containing a random selection of the range. I was more interested in spending my money on and painting the figures, than the gaming aspect. However my interest piqued with Tunnels and Trolls and I purchased my own copy of the fifth edition of the rules, borrowing the solo dungeons ‘City of Terrors’, ‘Naked Doom’, ‘Arena of Khazan’ and ‘Buffalo Castle’ from my cousin. 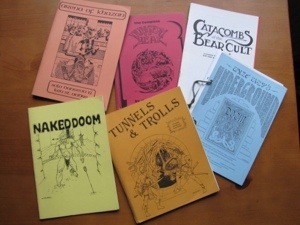 A selection of my Tunnels and Trolls collection; ‘Arena of Khazan’ and ‘Naked Doom’ are firm favourites and also some of the toughest solos. Eventually my cousin lost interest with his gaming gear and I bought most of it, some of which I’ve pictured here. I’ve kept the books in as best condition as possible for the past 30 years and before anyone asks, none of which are for sale! Though I don’t actively game anymore, those fun days of thirty years ago set me up for a lifelong hobby that I’ll continue to enjoy for a good many years! This entry was posted in Classic Traveller, Tunnels and Trolls and tagged Citadel, Classic Traveller, Solo, Tunnels and Trolls. Bookmark the permalink.